I attended a preacher’s gathering a few days ago at a retreat center located in the foothills of the Sierra-Nevada mountains. Warren Baldwin facilitated much of the discussion for us, and part of what he shared included the five types of dysfunctional leaders as defined in McIntosh & Rima’s book Overcoming the Dark Side of Leadership: How to Become an Effective Leader by Confronting Potential Failures. As with any sin, the first step towards repentance is acknowledgement. Leaders have to be aware of their shortcomings before they can change them, and I found this list to be quite insightful. 1) The Compulsive Leader – These types of leaders feel like they have to do everything. They manage every aspect of a church, refuse to delegate, and feel compelled to give their input into everything. They lack trust in others, and, as a result, fail to let anyone else take responsiblity for anything hindering others’ growth. Biblical example of a compulsive leader: Moses. 2) The Narcissistic Leader – These types of leaders are self-promoters. They’re stuck on themselves. Everything revolves around them – they need to be the center of everything. They need to look better, sound better, be better. They overemphasize their own strengths while devaluing the strengths of others. Biblical example: Solomon. 3) The Paranoid Leader – These types of leaders are shackled by suspicion. They’re paranoid that others are better, smarter, and sharper. They have an inferiority complex and are desperately afraid of someone stealing their limelight. They overreact to the mildest forms of criticism and blow up if someone causes them to be even slightly embarrassed in front of others. The most common manifestation of paranoid leadership in churches is a senior minister refusing to let other staff members preach because the congregation may like others’ preaching more than their own. Biblical example: Saul. 4) The Co-Dependent Leader – Co-dependents don’t chart a course – they simply react to what others are doing or have done. Co-dependents aren’t leaders, they’re reactors, and are notorious for withholding critical information from others causing ill-informed and bad decisions to be made. Biblical example: Samson. 5) The Passive Aggressive Leader – This type of leader feels like they need to control everything. When not in control, they passively reject performing and are often gossips with wicked tongues. The #1 symptom of a passive aggressive leader is that they’re chronically late. They use excuses to dominate and control situations (scheduling other appointments at the same time, coming late/leaving early). Biblical example: Jonah. Know anyone that fits one of these profiles? I’m ashamed to say it, but I waffle between #1 and #2. At least you are humble enough to admit your faults, Wes. Everyone has them, even (especially?) church leaders. I like what you said about leaders needing to be aware of their shortcomings before they can change them. That comes with accepting they have a problem and not guising it with pride- something probably every human being is guilty of at some point. The problem is, with a leadership position, people follow… And a leader of a church or ministry has even more power to cause great harm to his followers. You’re right, Jen. The potential for harm is there, but they also have the potential to do a lot of good. 1	Not many of you should presume to be teachers, my brothers, because you know that we who teach will be judged more strictly. 17	Obey your leaders and submit to their authority. They keep watch over you as men who must give an account. Obey them so that their work will be a joy, not a burden, for that would be of no advantage to you. It’s interesting to me that those under their care are told to “obey” and “submit” making leaders’ work a joy and not a burden. This isn’t something I hear taught very much today. The fact is in our independent, individualistic culture most people bow up against authority. People are more likely to get mad at a church leader and find another church to go to than to obey and submit as this passage in Hebrews directs. Obviously if a church leader is directing them to do something or believe something that goes against God it may be appropriate to leave, but in cases I’m familiar with that’s rarely what’s going on. Interesting observations. Obviously Jesus the the positive example of balanced leadership. I know you have been reading and studying leadership for a while, so why not give a list of what a leader ought to be? Also, the word “obey” in Heb. 13:17 is very interesting. The late Richard Rogers dug into this concept some years ago and the conclusion was somewhat surprising and interesting. You might do a word study on that verse and see what you come up with. Old Jethro, the heathen, gave godly Moses some good advice on leadership. It takes a wiser man to get ten people to work than to do the work of ten people. Good leaders delegate. Thanks for the comment and the idea. I’ll put some thought into that. I did a word study on “peitho” – the Greek word translated “obey” in Hebrews 13:17. According to my Bauer lexicon, it’s appropriate to translate that word as “(you) obey” or “(you) follow” in that verse because peitho is used as an imperative verb there and because of the context. For instance, in the very next verse (Hebrews 13:18) the indicative form is used, and the NIV properly translates it as “we are sure.” It would also be ok to say “we are fully persuaded” in that instance. Thanks, Wes, for this article. It was great meeting you in California! 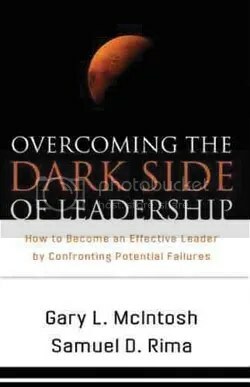 Did you already have the Dark Side of Leadership book? Read the interview in Christian Chronicle. Very good! I tried to leave a note once before but it didn’t take. Hope it will this time. Hi Warren – it was great meeting you too. No, I don’t have the book yet, but plan to pick it up after hearing your summary of it. Sounds like really good material. I think an important type of disfunctional leader may have been overlooked, and possibly the dysfunctional leader I am about to describe would fall under one of the five types already mentioned. This is the elder that blows his stack in meetings if challenged in any way and later outside of meetings resorts to methods of intimidation and threats. He will later by means of one-on-one hallway meetings verbally threaten to see to it that individual elders are removed and preaching staff replaced if they fail to agree with him on issues. This particular old church has for years been known as a “Martin Church”, and it just so happens that this mans last name is Martin. (name has beeb changed to protect the innocent). This one man does not really have the power to remove elders or fire preaching staff on his own because it would require a concesus vote. But he wants all of his oppositon to think that he does. He is an older fixture of the church, and a loose cannon, and the remaining elders and preaching staff are at a loss as to how to handle the guy. Just revisited your page here, Wes. Thanks for publishing this. I remember that retreat with great fondness. I’ve continued to work with this book, too. Each time I go over it some new insight emerges. Hope you all are doing well.